Recommended for white or light colored fabrics in polyester/cotton blends, 100% cotton fabrics, nylon, mouspads, silk, and other specialty items. 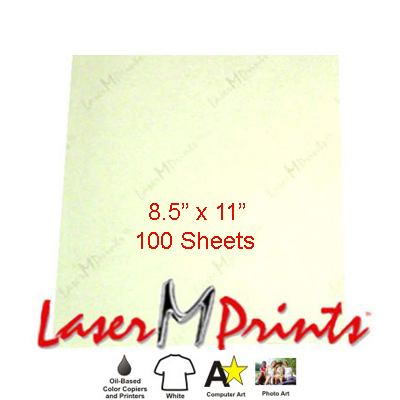 LaserMPrints CL v2 8.5"x11" Transfer Paper 100 sheet pack. Reproduce graphics or photos on white and light color poly or cotton. Use in oil-based or non-oil laser copiers or printers. Produces a thin, soft hand with bright, durable designs. 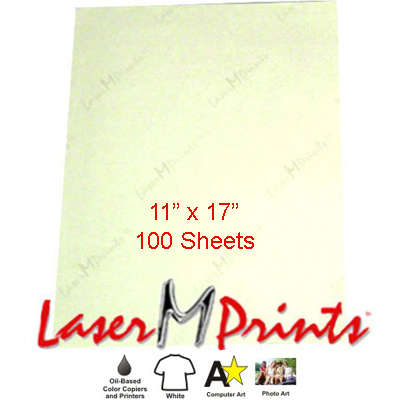 LaserMPrints CL v2 11" x 17" Transfer Paper 100 sheet pack. Reproduce graphics or photos on white and light color poly or cotton. Use in oil-based or non-oil laser copiers or printers. Produces a thin, soft hand with bright, durable designs.